A belated retraction of his sniping condemnations of two Garda police whistleblowers -- two men who had bravely and correctly revealed corrupt practices in the force -- did not assuage public anger over his repressive handling of the Department of Justice. This week brought a new and even graver scandal about illegal recordings by the Gardai police, of every conversation to and from major police stations since the early 1980s. Calls which were recorded and subsequently made available to prosecutors included confidential and privileged exchanges between defendants and their lawyers. Although the practice was quietly terminated in November, Shatter continued to plead ignorance of the matter. Despite unprecedented pressure to resign, the wealthy barrister and landlord refused to apologise for his high-handed response to those two members of the force who first broached the issue of Garda corruption on motoring offences. Mr Shatter had been widely criticised for the false accusation that whistleblowers Sergeant Maurice McCabe and ex-Garda John Wilson had ‘failed to cooperate’ with internal probes into the quashing of penalty points. The remarks had been seen as an endorsement of those by Garda Commissioner Callinan, who had dramatically denounced the whistleblowers actions as “disgusting” before a parliamentary committee. Callinan was effectively fired on Monday by the Taoiseach, Enda Kenny, leaving Shatter severely exposed. In a statement to the Dail on Tuesday on the Garda inspectorate report on the force’s handling of motoring offences, Shatter finally apologised and said he hoped it would “put this matter to rest”. “I acknowledge that this statement was incorrect. It was never my intention to mislead the House and I believe it is appropriate that I apologise to both and withdraw the statements made,” he said. But the Opposition parties quickly reissued demands for the minister’s resignation, criticising his handling of a raft of issues, including the whistleblowers, penalty points, allegations of bugging at the police Ombudsman’s offices, and the phone recordings. On Friday, Fianna Fail put down a motion of no-confidence in the Minister, hoping to flush out the position of the Labour Party, Fine Gael’s coalition partners. The practice of recording privileged communications drew fresh international attention to the manner in which the 26 County justice system has been undermined by the policies of successive right-wing governments. Judgements by the Special (non-jury) and regular Criminal Courts, the outcomes of the various several tribunals of inquiry, as well as ongoing prosecutions, are all now in jeopardy. The secret recording of phone calls began in a statist and anti-republican atmosphere at the height of the conflict in the Six Counties to record calls linked to the northern conflict, as well as emergency calls. However, even after the IRA ceasefire in 1994, the technology was updated to allow the use of dictaphones, and gain in 2008, when it was upgraded to a digital system. Archived documents have shown that the system’s upgrades were approved by the Justice Minister of the day and involved considerable expense, as well as the recruitment of specialist technicians. Lawyers in several high-profile legal cases over the past three decades are currently trying to determine whether their own communications were tapped. While reports in the mainstream media have sought to play down the significance of the tapings, there are growing calls for radical reform in the justice system. Shatter has attempted to keep his job by insisting he only become aware of the issue on Tuesday afternoon -- but his pleadings fell on deaf ears when parliamentary documents were found that show he had himself raised the issue, as an opposition spokesman, as long ago as 2001. Sinn Fein leader Gerry Adams there was a series of questions the government needed to answer in relation to how the tapings crisis was communicated and handled. 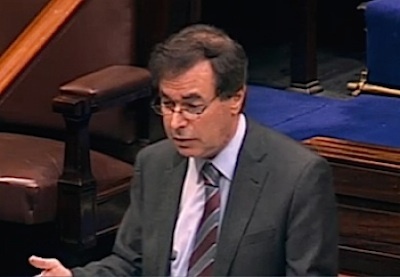 He said the coalition government should not feel it had gotten ‘off the hook’ following Shatter’s apology to the Garda whistle-blowers. “Sinn Fein wants to see real and far-reaching reform of the Gardai, similar to the changes that we helped bring to policing in the North,” he said.